With Christmas less than a week away, and many of us enjoying holidays at home with our loved ones, what better time to launch the Protagonize Winter Challenge competition? This time around — and in the spirit of the season, of course — we have a real prize, kindly donated by none other than one of our more prolific members, smac972. He was also kind enough to design the promotional banner you see to the right, and help out in figuring out the rules for the competition and judging. The prize, you ask? A full year’s Plus subscription to Protagonize. In addition, you’ll get a nifty badge for your profile, as was awarded to the victors of our previous Tales of Terror contest. The guidelines for this contest are quite straightforward: write something about kindness, and tag the story with the tag “Winter Challenge“. The contest will run until noon Pacific Time on January 4th, 2010. Any registered Protagonize member can enter the competition. All entries need to, in some way, relate to the subject of kindness. 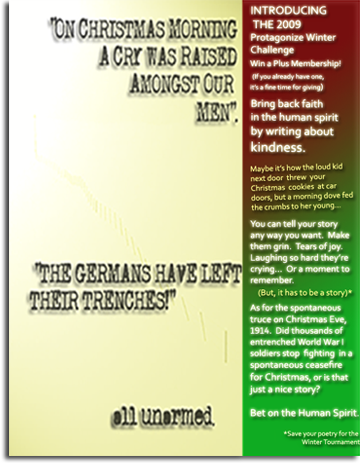 Stories entered in the contest must be solo, no collaboratives this time. All stories entered must be tagged “Winter Challenge“ (remember the quotes!). Only new stories (posted after this blog post) will be considered. Please don’t tag your old stuff or we’ll just un-tag it. However, deleting an old, orphaned entry and reposting it for the competition is fine. Multiple entries are fine if you so desire, as long as you adhere to all of the other entry rules. Addendum: As mentioned, mature stories are okay, but your story will not be featured if it’s mature. Your author profile will be featured instead (and yes, you’ll still get the badge.) Please keep this in mind when writing. Note: Make it sure to tag your story “Winter Challenge“ when you’re posting, or your story won’t be included in the contest! Subscribers who have rated must leave a comment on the story letting the author know that they’ve voted. The top-rated story as of January 4th at 12:00pm (noon) Pacific Time will be the winner. The top rated entrant will be rewarded with a free Protagonize Plus subscription for one year. The winner’s entrry will be featured on the site for the week as the Editor’s Pick. The winner will receive an achievement badge on their profiles declaring them the winner of the 2009 Protagonize Winter Challenge. That’s it! If you have any questions, please feel free to ask below, or over in the Protagonize Pub group. The competition starts right now. Gentle(folk), start your engines! This entry was posted in Contests & Competitions, Events, General and tagged competitions, contests, prizes, winter challenge, writing. Bookmark the permalink. Hey this might be a stupid question but is there a word limit or minimum? Definitely not a stupid question — there’s no maximum, just the usual 140 character minimum that you’d find in any story on Protagonize. This may also be a stupid question, but are we allowed to use characters from other stories we’ve already posted? Yup, that’s absolutely fine. You may want to make a note in the author guidance to clarify the character’s backstory, but that’s up to you. Can you please make a poetry competition of similar type? I’m not that good at prose writing. @Avismara We have a poetry competition every quarter — I think Rac7hel is running it this time around.